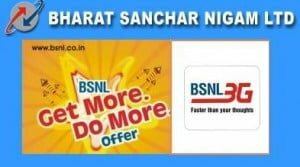 After Triggering price war in the 3G Mobile and Data service by most affordable Unlimited 3G Data Plan, Pan India 3G mobile service operator Bharat Sanchar Nigam Ltd (BSNL) today announced the launch of four super attractive new combo plans for its Postpaid and Prepaid 3G mobile service users across all the telecom circles. In an attempt to provide greater benefits to the 3G mobile service users, the all new Anytime Anywhere 3G Call and Data Usage Combo Plans works best for mobile phone users who need both 3G voice, Video and high-speed data connectivity. The plan offers customers a combination of Voice minutes, SMS and 3G data usage, with Full Value of Money as well as simplicity & transparency in both Postpaid and Prepaid. The New 3G combo Plans of Rs.300 provides 300 MB 3G Data, 300 Voice call(Local/STD), 300 SMS and 30 Free Local Video Calls. The other plans of Rs.500, Rs.1000 and Rs.2000 also bundalled with Full Value over Data Voice, SMS and Video callings. Free 3G Data, Voice/Video calls and SMSs bundled with the postpaid and prepaid plan to be consumed within the validity period. No carry forward facility on freebies are allowed. 3G Data usage will be valid for Home and Roam usage while all Free Voice/Video calls and SMS will be available only in Home Network/With in the circle usage. The MRP of Data RCV is inclusive of Service Tax @10.30%. Circles can suitably adjust the MRP in the price band upto Rs.3 (+/-) of above price considering the local market condition and technical feasibility. online recharge ho sakta hai kya,?